Of course, it’s important to feed your guests, but the food you choose for your wedding fare has a special significance. It should represent your shared tastes and the very idiosyncratic palate that you have created together for a couple. It should speak to the countless meals you’ve enjoyed together over the years and perhaps even the cuisines of destinations you’ve visited together. As the bard once write, “If music be the food of love, play on”. Your music should be more than something to get your tipsy dad up and dancing with his tie around his head (although it should certainly do that, too). It should be an audial roadmap of your relationship. Don’t just book any old DJ, use an experienced disc spinner like Benny Smyth DJ. A good DJ will talk to you about your relationship and try and cobble together a soundtrack to your love, interspersed with floor fillers to get each and every generation up and dancing. Many newly married couples are pleasantly surprised to find that married life is much the same as life before the big day and yet somehow better. But that shouldn’t detract from the momentousness of the occasion nor the importance of sharing it with the people who matter the most to you in the whole world. No wedding is complete without the closest friends and family who will get to witness your declaration of love for one another in the eyes of the law. This can be extremely difficult to digest in a climate where we’re so encouraged to put the minutiae before the momentous. We’re encouraged to agonize over colours and textures of bridesmaids’ dresses, the relative virtues of different cake flavours, the perfect shoes and which entrees to include for gluten free guests… But don’t let your absorption in the little things detract your attention from the fact that you love each other so much that you’re ready to spend the rest of your lives together. When things get stressful, when arguments start and when tempers flare, remember that most important fact and everything else will fall into place. When you look at the anatomy of a perfect wedding, it really doesn’t matter how much you spend. There’s a lot of pressure when it comes to your wedding day. You want to make sure that everything’s done just right, that it’s within budget, and that it looks amazing. Yupp, we ask a lot from our wedding days! However, it can be difficult to get our special day just right, especially if we’re lacking in inspiration. If this is your first time planning a wedding, then you might be a little lost. How do people make the wedding look and feel so good? Below, we take a look at ways places to look to make sure your day exceeds your expectations. This might be the first time you’re planning a wedding, but it’s surely not the first time you’ll be attending a wedding. Think back to the other weddings you’ve attended: what did you like, what didn’t you like? As a starting point, this approach will help you immensely. You’ll be able to understand straight away the things that you’re not looking for. 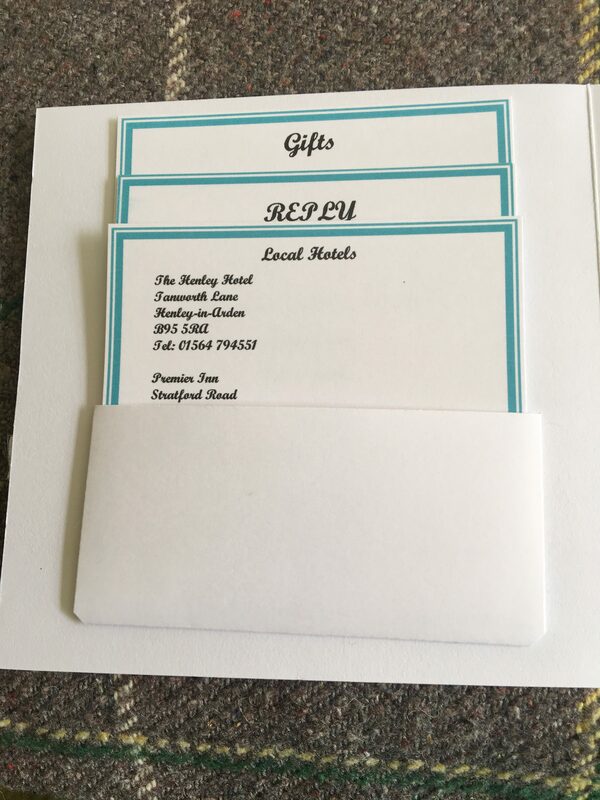 Though be careful not to take all the things you’ve liked about a particular wedding – it should be your own day, and things might get awkward if you’re inviting many of the same people who attend the first one…. A good way to think about your wedding is to look at the popular “themes” – such as rustic, minimalist, and so on – and then build your wedding from there. While it won’t take care of all the details, you’ll have a framework within which you can work. A useful starting point for those people who don’t know where to begin when it comes to planning. If you’re not full of confidence when it comes to planning a wedding, and can’t differentiate between the good ideas and the bad, then looking at working with an expert. By working with wedding planners Simply Elegant Weddings, you’ll have access to all the best trends and ideas when it comes to modern weddings. They’ll help to take care of all the “little” details that can make or break a wedding day. Finally, take a look at the backstory of you and your partner. This is your wedding, after all, and by drawing on inspiration from your backstory, you’ll be sprinkling your story over the whole event. The personality of the couple – the things they like to do, the drinks they drink, where they live, and so on – can (or even should) play the biggest role when it comes to planning the wedding day. So if you’re really stuck for inspiration, take a step back and ask yourself: who are we, and what would we look like in wedding day form? It’ll guide you in the right direction. There’s no single right way to have a wedding day, only your way! By juggling all the inspiration above, you’ll hopefully come out with a wedding day that is unequivocally your own – and which will turn out to be a day to remember. No one wants to have constant arguments with the person they love, but that’s what so often tends to happen during the wedding planning process. Sure, you’re both going to have opinions about how the wedding should pan out and how you should plan it. However, there are things you can do to make sure that you don’t have as many of those arguments. It’ll make your experience of planning your wedding a lot less stressful, which makes these tips more than worth your time. Talking can be one of the best ways to avoid arguments, and this is a piece of advice that applies to your everyday life as much as it does your wedding plans. But it matters even more when you’re planning a wedding because there are so many little decisions that need to be made, and they should be made together. You’ll be able to work through disagreements more easily if you talk about them. Sometimes, one person can take over most of the responsibilities of planning the wedding. And let’s face it; it’s usually the bride. This often happens because the groom is less interested in the process, but it’s still worth trying to do things together and make all of the decisions collaboratively. That way, you’ll both be kept in the loop at all times, and that has to be a good thing. You need to know where the money for this wedding is going to be coming from because arguments over money are very common, especially when you’re planning a wedding. There are wedding loans with bad credit you can make the most of if you need some extra help. Or you might be getting money from your parents. Whatever the solution is, it needs to be clear and agreed on. There is a lot of stress that’s going to be experienced when you’re planning out a wedding, and that means you will all need to get better at supporting one another. If you don’t, the stress could get the better of you or your partner, and that’s when the major arguments can start to break out. So just try to get better at supporting one another throughout the whole planning process. There are going to be disagreements between you and your partner when you plan your wedding. But you can’t create a big drama out of every little issue. If you do, you’ll both be wanting a divorce before you’re even married. Try to pick your battles and only make your point forcefully if it’s something that you’re really passionate about. Arguments are pretty much par for the course between brides and grooms when they’re in the wedding planning process. However, these are never helpful and they don’t have to happen. If you follow the guidance that’s been laid out for you here, you’ll be able to avoid most of those planning arguments. There’s no way around it – planning a wedding is a lot of hard work. Plenty of time, money and effort will go into the organisation of your dream wedding, but when the big day does eventually roll around, it will all be worth it. However, the wedding planning process can be made even more complicated when you have to take the needs of your family into account. If you are intending to invite entire families, children and babies to your wedding, you will need to ensure that the occasion is family-friendly and that their needs are catered to, as well as your own. Of course, we all know the main points of wedding planning, from picking a date and choosing a venue to finally deciding on your dream dress, but have you spared a thought for the finer points of the day? With so much to keep in mind, it can be incredibly easy for even the most organised of couples to suddenly realise something has been overlooked. Granted, it may not be one of the most important parts of the day, but when you have been looking forward to tying the knot for weeks, months, or even years, you will understandably want everything to be perfect. So, to help you out, here are a few things definitely not to be missed during the process of planning a family-friendly wedding. Granted, this might seem obvious, but there is a lot more to consider than just which venue looks the best and fits within your budget. Location and capacity are essential, but you should also check that your chosen venue is suitable for children. Looking for a specific service? Some venues offer optional additional services like the assistance of a wedding planner or help with decoration or catering, so it may be worth seeing if you can get a good deal here. For more venue inspiration, visit this website. If you do have a lot of questions to ask, it may be worth making a quick checklist that you can then run through when you are shortlisting venues. That way, you can guarantee nothing will be forgotten! Depending how many children you are planning to invite and how old they are, it may be necessary to tailor certain elements to your younger guests. Older children will usually be fine at weddings, but the younger the age bracket, the more easily they tend to get bored. Luckily, there are a number of ways that you can go about staving off the boredom and making sure everyone has as good a day as you! If you are really worried about the little ones, you could always hire a professional entertainer to keep them occupied during the day. Seating plans can be a massive headache, especially if you have to contend with arguments, fallings out and other family drama. If you are planning on a set seating plan, try to sit people who know each other together. This way, everyone will be able to chat to someone they already know – save the mingling for the dancefloor! You will also need to keep certain things in mind when planning out your seating plan. Sitting bridesmaids, page boys and any other key people near the top table can be beneficial during the speeches. Similarly, if you are worried about young children getting restless or fed up, it may be sensible to sit them a little more out of the way so they can easily get down from the table and play if they become bored. At the end of the day, the most important thing is that you enjoy the occasion and make the most of your wedding day. Marriage is a big commitment, but when you are prepared to spend your life with the person you love, that should be the real focus of the day. However you choose to celebrate tying the knot, as long as you are happy, your wedding day is sure to be a success. In just under 8 weeks now it will be our wedding Day, I can’t tell you how excited and nervous I am. We have just sorted the suits out for my fiance, Dad, Best Man & Usher. My nephew Jack really wants to look and wear the same thing as the others, that is where Dobell come in. They offered to send Jack a shirt & Tie Cravat for the wedding from their website, which specialises in formal wear for men and boys. We opted for the Wing collar plain fly front shirt, Priced at £15.99 but currently in the sale at £12.99 and the Mint green cravat tie priced at £8.99. I ordered an age 9-10 shirt as Jack will be 10 next year but age 8-9 can be a little small. I haven’t got any photos of him wearing them with a suit just yet – but keep an eye out on my Twitter, Facebook and Instagram at the end of October, I’m sure I will have lots of photos then! *We were sent these products free of charge for the purpose of this review. However, all words and opinions are our own. As many of you know already that read my blog or know me on a personal level that I get married in October. I always knew that I wanted to handcraft my very own wedding stationery. Back in February was when I ordered all the stuff I needed and started making them, you can read all about it on my facebook page Kimz Kardz & Kraftz. 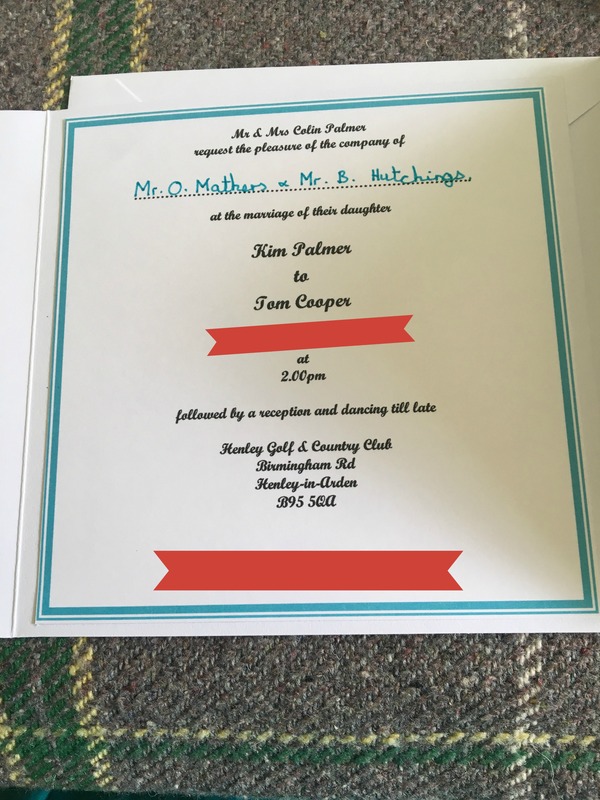 The colour scheme was between purple, coral & Turquoise, our original wedding date was July and I choose Turquoise as it was a lovely summery colour. Then when I discovered I was pregnant just before Christmas and due in July we had to postpone the wedding but stayed with the same colour scheme. I ordered alot of stuff off ebay as delivery is good and it is good quality too. 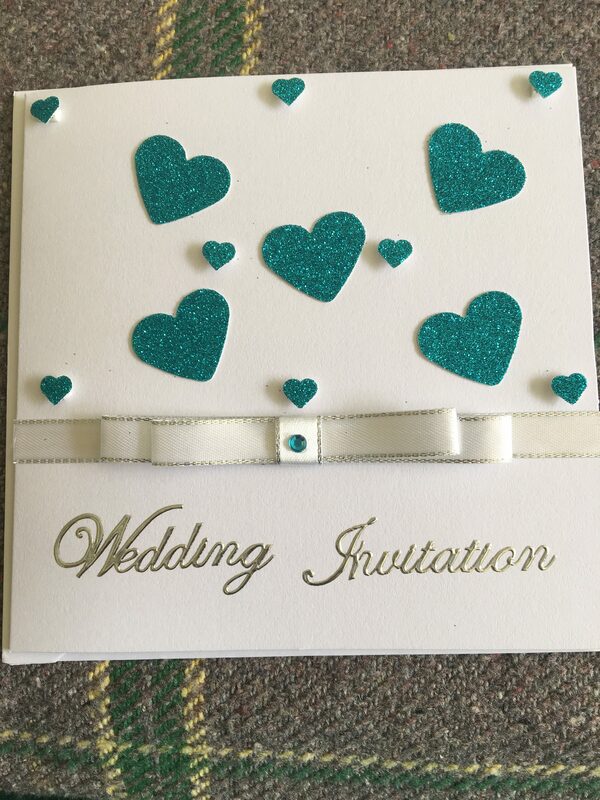 The design I went for was a simple yet very effective style of invite, with delicate hearts and a handmade bow on the front with embellishments to finish it off. All the hearts were punched out by hand for each invite also. The inside was all printed off and cut to the correct size to fit perfectly within the card. My dad designed the little pocket to put the rsvp, gift list and hotels in. I added a colour border round the edge to make them stand out better on white card. I couldn’t of asked for them to turn out any better than they did. It took me a total of 4 months to complete but that was down to other personal commitments we had in the family to deal with. Now I have completed them I would offer these to purchase at a price of £5.95 all in, excluding delivery. They can be in any colour scheme to suit your special day. If you know anyone that is getting married and would love handcrafted bespoke wedding invitations then head over to my facebook page for all my designs and message me for a free no obligtion quote. Weddings are a day full of traditions. Some of them are wonderful traditions that no wedding could do without. Others are tired cliches that your guests will roll their eyes at. Weddings that are full of these cliches end up being carbon copy days that guests have attended a hundred times before. They’ll get mixed up with all of the other uninventive weddings and people will hardly remember your special day. It also doesn’t allow you to inject any of your own personality into the day if most of your decisions are being made based on old traditions. Ask yourself what you and your fiancee want to do on your wedding day, not what you think you should be doing because it’s traditional. If you want to make your wedding a day to remember, avoid these cliches at all costs. If you don’t match any of your color palettes at all, your decoration will look odd. It’s always a good idea to use colors that accent one another, but things can get a bit too much if you go overboard on matching colors. A wedding where everything in sight is the same garish shade of pink is going to be incredibly tacky. People will always remember your wedding but for the wrong reasons. You should use some color matching, but only in subtle ways. Matching flower arrangements and table decorations ties the room together well, without being too in your face about it. When people are going wild with matching color schemes, they tend to incorporate the bridesmaid’s dresses. This usually ends up with a group of bridesmaids that are unhappy with the awful dresses they’re wearing. Traditional styles that are covered in frills and puffy arms might have been fashionable once, but now they’re just cringe-worthy. Don’t feel the need to go for something like this because it’s traditional, you’ll all regret it. Just choose something more understated and elegant. It’s also a good idea to get some input from your bridesmaids, they’ll be the ones wearing them after all. Picking rings is one of the biggest challenges you’ll face when you’re planning the wedding. Lots of couples struggle and end up going for something boring because they think it looks like what a wedding ring should look like. The truth is, there is no right answer when it comes to picking rings. Places like tacori wedding rings offer more interesting styles that have more personality. Choosing something that reflects you and your partner as people is far more special than getting something that fits your idea of a traditional ring. ‘At Last’ by Etta James is named as the most overplayed wedding song out there. It’s still a great song, but how many of those people that choose it were fans beforehand? Probably not that many. It isn’t a special first dance if it isn’t personal to you and your spouse. It’s much better to pick a song that has good memories for you both and is an important part of your relationship. Weddings are all about the little details. As the most beautiful day of your lives, you want it to be perfect. But that takes a lot of work and a lot of attention to pull off. You might spend weeks agreeing the floral arrangements, the menu, and the cake topping. You should also take the time to plan your ceremony in full. Did you know that you can decide the order and the details of this important event? Religious ceremonies often follow a traditional order of readings and vows. Other ceremonies performed by celebrants and officiants also tend to follow a typical order. However, you can decide exactly what goes into the ceremony and most of what should be said. Only the legal vows required by your state or country must be said as laid out in law. The rest is up to you and your celebrant. So what order would you choose? At many weddings, the Groom and his Best Man arrive first and take their places at the front of the venue with the celebrant. Guests soon arrive and take their places either on the Bride’s side or the Groom’s. You might prefer that both the Bride and Groom arrive together. You can choose to have music accompany your walk down the aisle or not. As for your wedding party, they can walk ahead of you or behind you as you please. The ceremony often includes a welcome and ends with a kiss. What happens in between is up to you. You might want a song, a poem, a video, or vows to be read. If the ceremony is religious, there is likely to be a prayer. If you are giving each other rings, you can choose when they are presented and who will be carrying them. If you’ve chosen to match the mans and womans wedding bands, then it might be nice to have them carried on a pillow by a flower girl or ring bearer. Perhaps you prefer something less formal, or you each carry the other’s with you? When you book the ceremony venue and celebrant, confirm how much time you are entitled to. This might determine how much you can fit into this part of the wedding. Ceremonies are often very short and limited to a quick exchange of vows, rings, and a kiss. For such an important event in your life that brings you both together forever, you might prefer to do more. You might even include other members of your wedding party. Before you leave the ceremony, you must both sign the official register and be formally witnessed doing so by two guests. Many religious ceremonies leave this bit out. However, until it is signed, you might not be recognised as legally married in the eyes of the law. It’s the official bit, and can often feel like that awkward ‘bump’ in your big day. Think about how you would like to approach it. The signing of the register can be a nice photo opportunity if staged well. All weddings are beautiful and elegant, regardless of the order of events. How will you choose the order of events for your big day? Dodge These Wedding Faux Pas! Weddings, apart from being the most special day of your life they are also big events that need to be planned and choreographed correctly to be successful. With that in mind read the guide below to find out what some of the most common faux pas are, and how to avoid them altogether. Urgh, one of the most embarrassing and annoying weddings faux pas is forgetting to invite someone important. It could be that there invite got lost, or you haven’t seen them for a while as they got left off of the first draft of the list. But whatever the reason it can be very awkward trying to explain why everyone else has received their invites and they have not. So what can you do in this situation? Well if you have genuinely missed them off completely, and you think they will be upset by this, it may be better to use a little white lie and tell them that their invite was lost by the postman. Yes, I know it’s not wholly honest, but to save their feeling, I guess it’s OK? Another wedding faux pas that you really don’t want to make is picking rings that don’t compliment each other. Remember you have spent all that time choosing the perfect diamond for your engagement ring, and getting the style just right, so you really should do it justice by picking a wedding ring that matches it well and shows it off to its best advantage. One tip for doing this include trying to keep the colours of the metal the same. So if your engagement ring is white gold, your wedding ring should be too. Also, think about the shape of your wedding ring, if you have a large diamond in your engagement ring, you may need to go for a V-shaped wedding ring, so its sits flush to the stone. One of the biggest faux pas folks make when they get married is to spend every last penny on the wedding. Yup, I get that you want it to be a special day. But it can also help to have a little foresight. The marriage isn’t the end of something, it’s actually beginning of your life together, and do you really want to start that life completely flat broke? Probably not. So don’t let your wedding costs get too out of hand, as all you are doing is putting more strain on the first few months of your marriage. Lastly, everyone loves a wedding where the bar is free, right? But is it always a good idea to provide drink all night? Well, it really depends on what you are going for. It can help everyone get up, and dance and have a good time. However, if you have guests that are likely to be daft and drink a little too much, you may end up with more trouble than you bargained for. Something you probably don’t want to risk on your wedding day. Congratulations on your engagement! Getting married will be one of the best days of your life so far. However, the hard work begins now, and you’ll need to get your notepad and pen ready to begin the planning process. You’ll inevitably have some last minute things to check and tick off your list i the weeks running up to your big day; however, you’ll need to make sure that certain, key areas of your wedding are planned and set n stone from the get-go. Organising as much as possible will help to alleviate any stresses and jitters on the run up to getting hitched; so check out the following things and start jotting down your notes. The sooner you and your spouse-to-be sort out your guest list, the better. Knowing exactly how many people will be turning up to help to celebrate your big day will determine the venue you book, and all the added costs of food, drinks, and any entertainment. Therefore, consider your budget first and give yourself a set number that you’re happy to invite. It can be difficult choosing who to leave off of your guest list, but try to remember that you’re not out to offend anybody; weddings are expensive, and people will understand your reasons, so be brave when you’re planning who to send an invitation to. 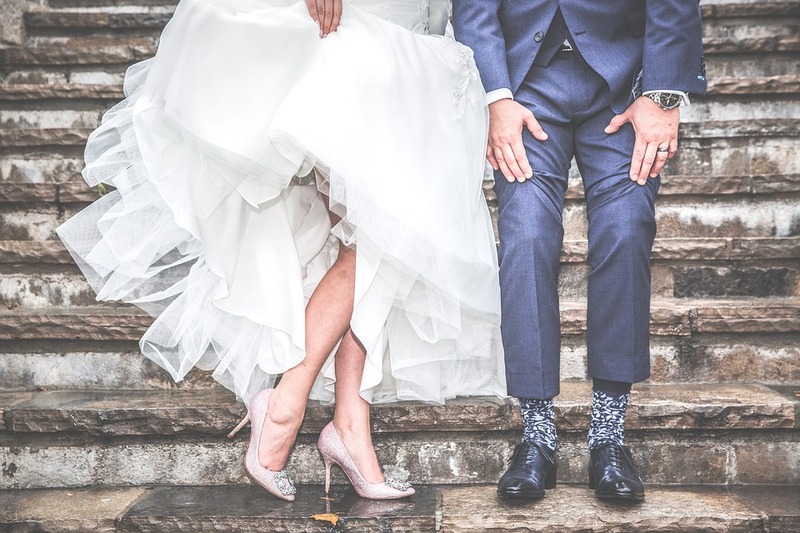 If you’re struggling to narrow your list down (and need to), then take a look here: https://bridebook.co.uk/article/11-wedding-guestlist-arguments for some help and advice, and to avoid any arguments with your future Mr or Mrs. So, you’ve managed to sort out your guests (well done); now to organise exactly where and when you’re going to say “I do.” The location of your big day should reflect who you are as a couple and be somewhere that you know will help you to make some of the best memories ever. As in the UK, there will be plenty of locations, like Château Bouffémont, that cater for wedding packages and make it as straightforward as possible to organise your stay. If you’re planning to get hitched abroad, then it’s crucial that you book as soon as possible so that your guest will have the time to organise their trip after they receive their invite. If you are planning to book a venue for more than just the day, because you’ll need accommodation for attendees and yourself, ensuring that it’s booked well in advance will prevent any last minute hiccups and changes. Popular venues book up pretty quickly, especially throughout the summer season, so do not leave this part of your wedding to the last minute, or you could end up somewhere that you would never normally have picked. The location of your big day will also affect the potential weather woes, so take the environment into consideration, so that you can plan clothing, decor, and food accordingly. If you want a festival style wedding, for example, you’ll want to ensure that you and your bridesmaids aren’t wearing stilettos all day, so bear the terrain in mind.